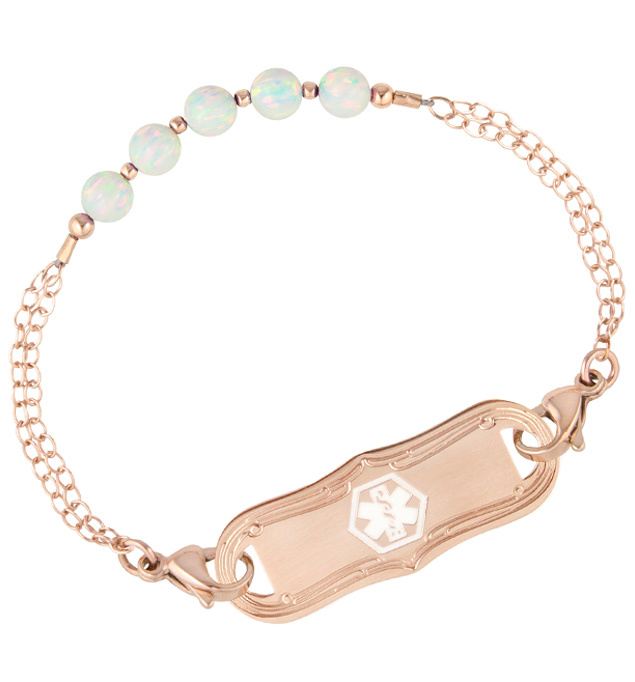 There’s something just a little extra special about our Celeste Medical ID Bracelet. With dual strands of fine rose gold chain on either side of a center block of five shimmering white opals, the center block is punctuated with glossy rose gold accents. It’s at once a simple yet balanced design that’s beautiful alone or stacked with your favorite rose gold pieces. Interchangeable and chic, the Celeste Medical ID Bracelet is a Lauren’s Hope Signature Style, exclusively designed and crafted in our Kansas City studio. Your Celeste Medical ID Bracelet pairs with any custom-engraved Lauren’s Hope medical ID tag, keeping what’s truly most important to you right at hand. This stylish med ID is a great choice whether you or your loved ones wear medical alert bracelets for a history of weight loss surgery, lymphedema, celiac disease, epilepsy, or any other chronic medical condition or treatment consideration. Custom engraving allows you to choose the look you want so you can stay safe in style.